The HydroSense II replaces the original HydroSense adding a number of sophisticated functions for portable monitoring. It consists of a 3" display attached to either the CS658(P) (20cm) or CS659(P) (12cm) soil sensor. 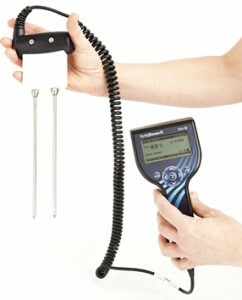 The Pole (P) version includes an 82cm insertion pole to enable you to take readings without bending.